Select the dotted area immediately to the left of the 'address' toolbar you just added. Drag this to the top of the screen. The address toolbar will appear across the top of the screen. Now right click the toolbar and select 'auto-hide' and 'always on top.' The address toolbar will now pop up whenever you move your mouse to the top of the screen. To make for a smoother computing experience, disable the error-reporting feature in windows XP. This will prevent error boxes popping up after application crashes, and upon restarting Windows after a fatal crash. The Windows XP start menu incorporates a built-in delay between the time your mouse pointer lands on a menu and the time that menu unfolds. This can get annoying after a while. Using the registry, you can speed up menu response, speeding up your computing experience. The default is 400; lower values will speed up the start menu. Setting it to 0 is not a good idea unless you like 5 or 6 menus popping out at you every time your mouse pointer strays, but experiment to find your favourite setting. The quick launch bar is one of the most essential windows navigation features, introduced (with minor but well-deserved fanfare) in Windows 98. Through Windows ME and 2000, it continued to give sterling service to computer users across the globe with its unbeatable combination of customizable and convenient one-click shortcuts and that essential 'minimize everything now' button. 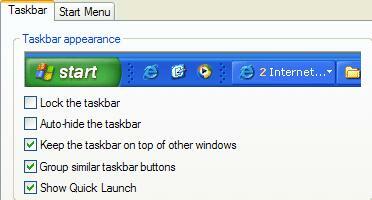 With the dawn of Windows XP, the quicklaunch bar was suddenly and inexplicably gone from the taskbar. This probably contributed more than any other factor to Windows user's initial alienation from XP's interface. But fortunately the quicklaunch bar still exists, it has just been disabled by default. With a few clicks you can get it back where it belongs. Now look for the option entitled 'show quick launch.' Enable it. Now that your quick launch bar is back, you can drag and drop shortcuts onto it from the desktop to customize it.